Today was a great day for Gary Middle College! GMC is a school we started in 2012 with the expressed intention of supporting nontraditional students who want to earn their high school diploma and get prepared to go to college and/or to go into a career. There are many high school students who can’t attend a traditional school due to family issues and demands. Even our traditional school has trouble serving these students due to our daily schedule. Some students need flexibility and more individual attention than traditional schools can provide and many of these students don’t see a need, nor have an interest in programs traditional schools provide such as sports, clubs, and other enrichment opportunities. 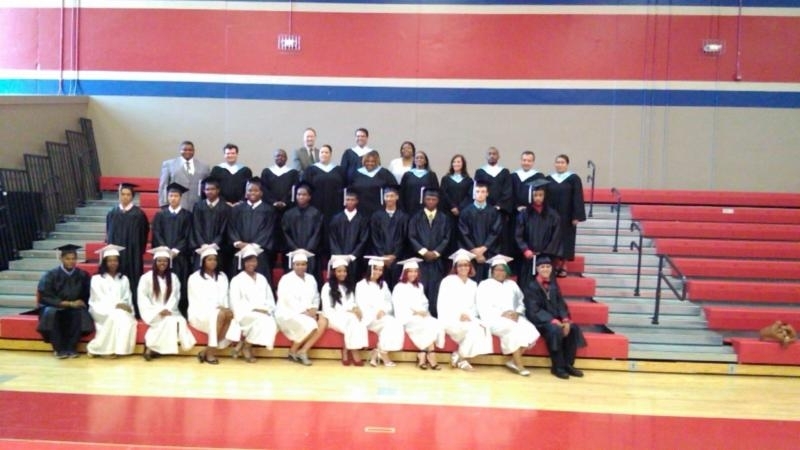 Enter Gary Middle College (some of our graduates are pictured above). Gary Middle College provides a flexible, year round schedule with three sessions a day–morning, afternoon and evening–and we cater to students who may have babies or families to support but want to complete high school and go to college or earn a career certification. Yes, we provide child care free of charge to our students. We currently serve 240 students each year and every student who graduates not only earns their high school diploma, they also earn at least three college credits or a career certification. (pictured above) traveled to Gary, Indiana (on her own dime) to visit both of our schools in Gary, including GMC. She heard many stories from our students aspiring to earn as many college credits and career certifications as possible while in our schools.